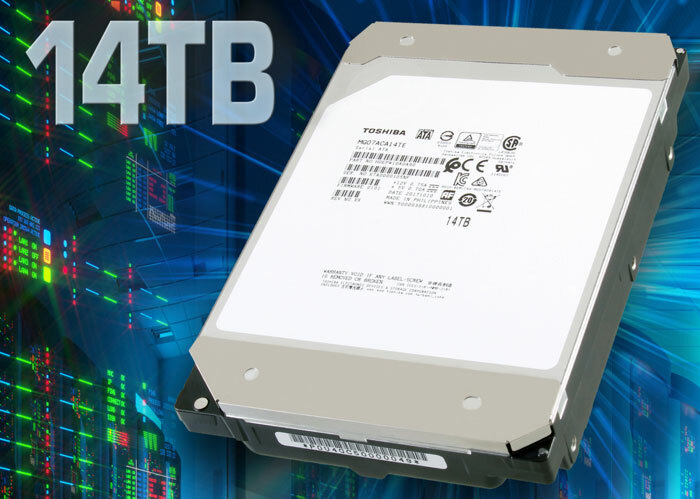 Toshiba has launched a high capacity 3.5-inch HDD which it claims is “the world’s first enterprise 14TB Conventional Magnetic Recording (CMR)” hard disk drive. The 14TB Toshiba MG07ACA Series uses a 9-disk, helium-sealed design and is said to deliver an attractive density and power efficiency for enterprise storage solution providers to achieve their TCO objectives. Toshiba also launched a 12TB version with 8 platters. Benefits of Toshiba’s CMR/PMR drives are that they work with existing server and storage system architectures. Meanwhile, rival SMR (shingled magnetic recording) HDD products require adjustments to server and storage systems that will take some organisations “several years,” according to a quote from John Rydning, Research VP for hard disk drives at IDC. The MG07ACA Series platters spin at up to 7,200 rpm and the Helium atmosphere enveloping the disks reduces aerodynamic drag to deliver a lower operational power profile. Toshiba has put in extra effort to make sure the Helium gas doesn’t escape the disk enclosure by utilising a precision laser welding technology at all joins. Toshiba says it has already started shipping out samples of the MG07ACA HDD drives. We will have to wait a while longer before they reach further distribution channels. As they are aimed at cloud and business data centres I wouldn’t expect these SATA 6.0Gbit/s interface drives to appear at retailers like Amazon. I had to re-read that a couple of times: Conventional Magnetic Recording. Is that *really* what CMR stands for? I guess they are just impressing that this isn't a shingled drive. It will, with one caveat, but the timescale is unclear. The caveat is that while price/GB competitive pressure lowers prices furtyer down, there is a base price beyond which manufacture is not feasible, and is new technologies come with expensive new plant to install, then it may be a long time before that price pressure appears and if that base cost point rises too much, sub-£100 drives may never be feasible. In other words …. who knows?